OtterBox have become well known for their phone cases which makes your phone pretty indestructible. If you love your phone in one piece (like me) then OtterBox phone cases are your best bet for keeping it intact. 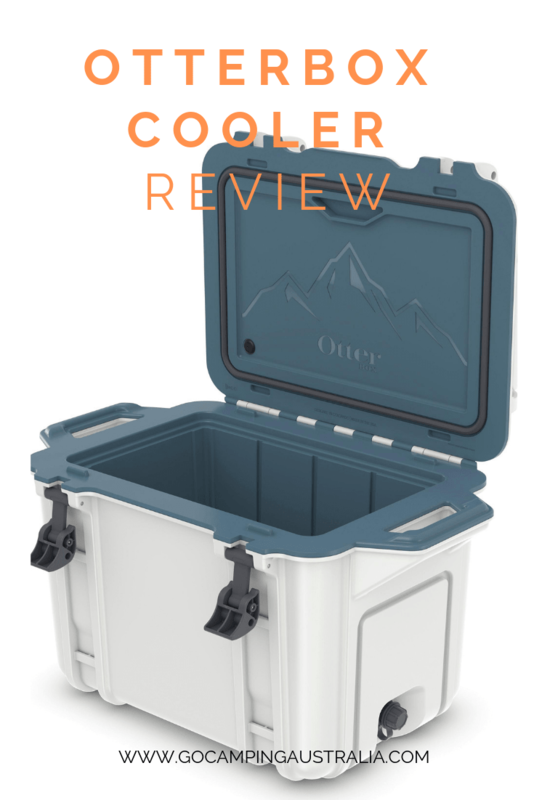 Now OtterBox have expanded their range into the outdoor market, and are taking their skill and knowledge of construction, and using it in the very popular but crowded market of camping coolers/eskies. Their outdoor range includes soft sided coolers and hard coolers, plus a load of separate accessories to complement the coolers. 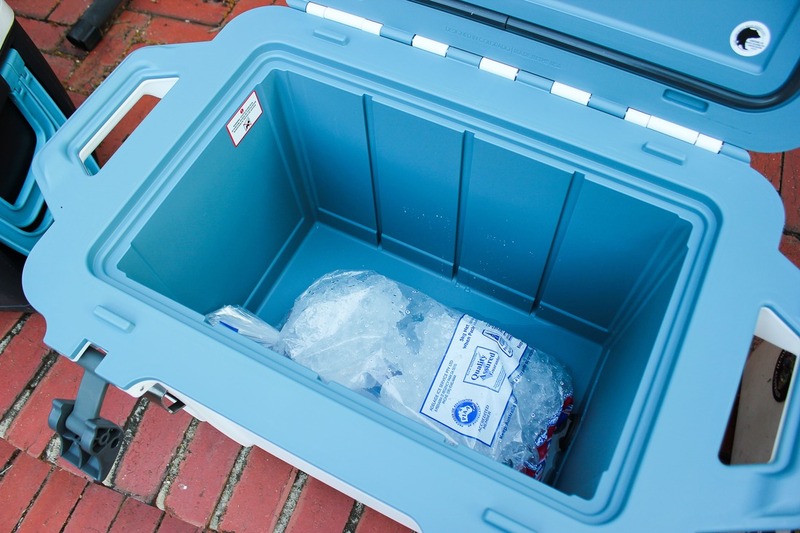 When we got a chance to review the Venture 45 cooler, we wanted to see what made this cooler standout from the average one you see at camping stores. 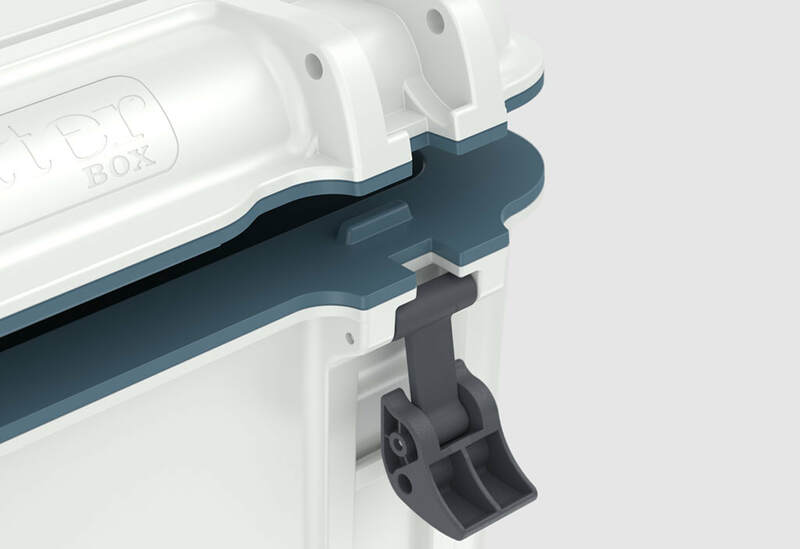 I believe the OtterBox is aimed at those who don't have the ability to have a fridge in the back of the car - the campers who want their food and drinks cold, but don't have the electrics in their vehicle. Car campers who can carry their cooler to the campsite and not rely on the vehicle to keep the fridge running. We are testing the Venture 45, which is referring to 45 quarts - so for us in Australia, that is 42.5 litres. The first thing that strikes you is the size of this cooler - it's big. ​But it looks incredibly solid (and quite stylish) too - nothing flimsy about any part of this cooler. The OtterBox construction seen in their phone cases, is visible in this cooler as well. The inside and outside is made of polypropyolene which means it has good strength, very resistant to absorbing moisture, but the insulation is the important part of this cooler - it has two-part polyurethane insulation. This sort of insulation is effective against temperature changes, and has very high thermal resistance. The Venture 45 is designed to be strong. In fact, it's bear certified which means if you have a grizzly bear near you and the appropriate locking mechanism in place, your food and drinks are safe. In Australia, the chances of encountering a grizzly is extremely slim, and koalas are only after their gum leaves. But we do have marauding wombats, overly inquisitive and destructive possums and the foxes and kangaroos that like to frequent camp. 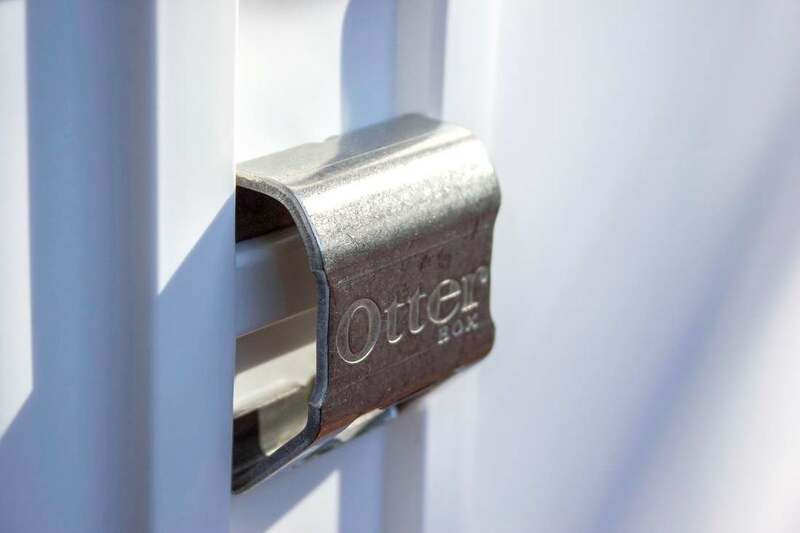 To see the strength of the OtterBox, see the video below. Not that we are suggesting you drop a piano on it, or use a wrecking ball with it, but you can see what its capable of. The durability of the OtterBox means it's not what you would call lightweight. With it empty, I can manage picking it up. Full, I would struggle and definitely it would need to be a 2 person job to lift. If it had detachable wheels or a little trolley to put it on, I think that would help a lot - especially for me. The latch system is not one I have seen before, and it's very clever. 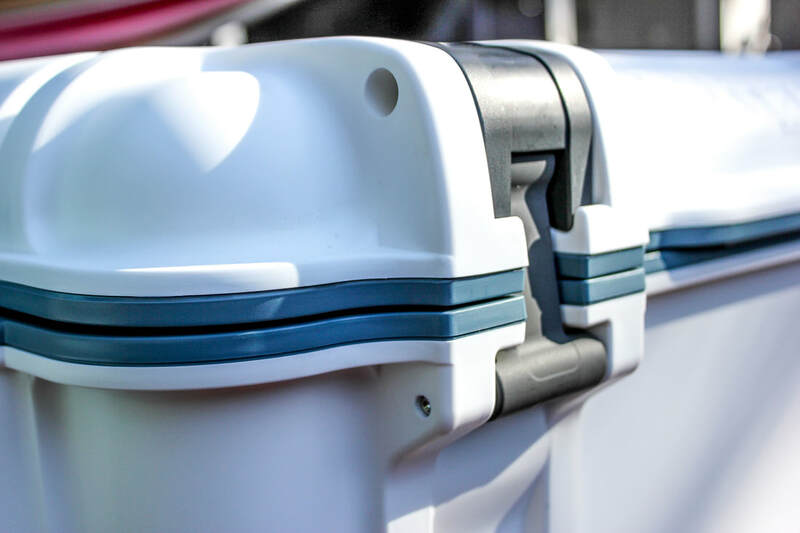 They are like levers made of silicone and once you get the hang of them, they are really easy to use and all seamlessly fit into the design of the cooler. Handles are rigid and don't drop down, so you need to factor that bit of extra space either side of the cooler into consideration when packing up your car. But at least they are comfortable and strong. You don't have any fear of them falling off or snapping. Inside the cooler, the bottom slopes towards the drainage plug, which means that emptying water from the cooler requires no extra lifting; the water drains quickly and slightly away from the cooler. I liked that simple, extra feature quite a lot. There are non slip feet on the bottom of the OtterBox so if in a boat, its not going anywhere. 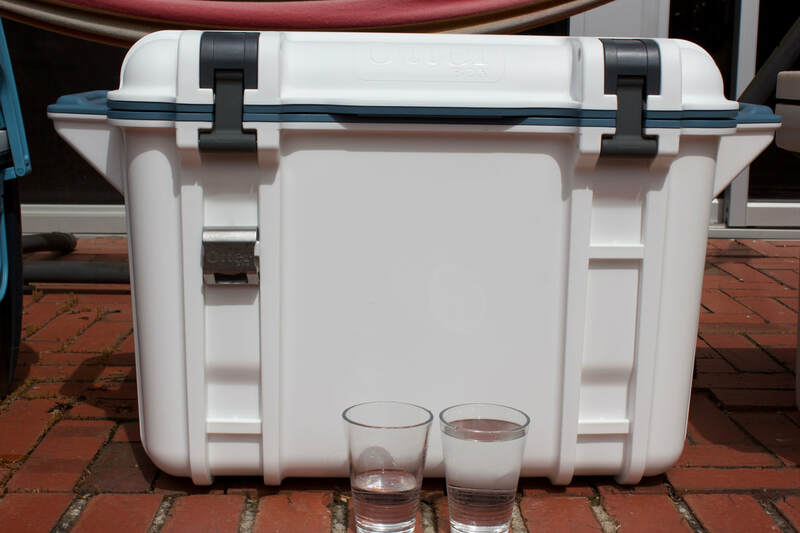 Accessories are extra should you want them, such as drink holders and chopping boards, which is something that is nice to have but chances are you might already have them in your camping supplies, so they are extras I don't look at when looking for a cooler. But it does come with a bottle top opener, which you clip on wherever you want on the actual OtterBox. I am glad that is included, and not an extra you have to pay for. So will ice last? That's really what everyone wants to know about when buying a cooler, right? We put the Venture 45 to our non-scientific testing process. 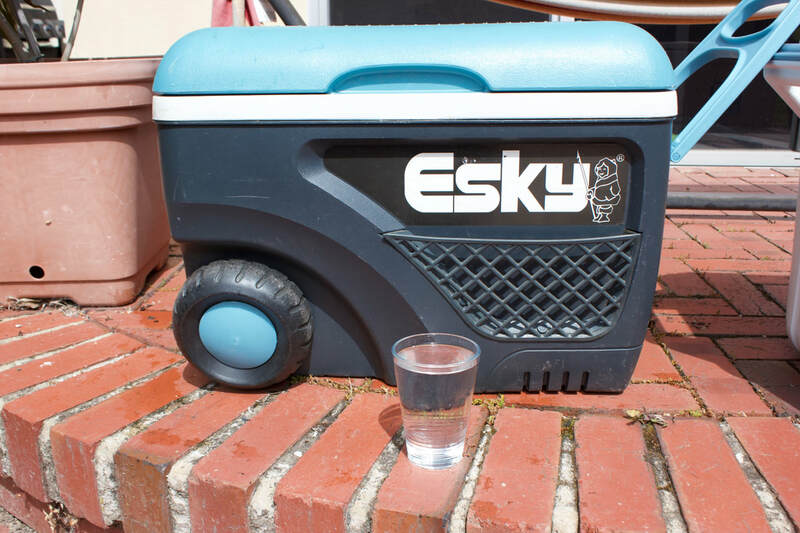 How would it compare to our old faithful esky - the Techni Ice (similar internal size) - and our first esky (and a lot smaller) blue one, called the Esky by Nylex? 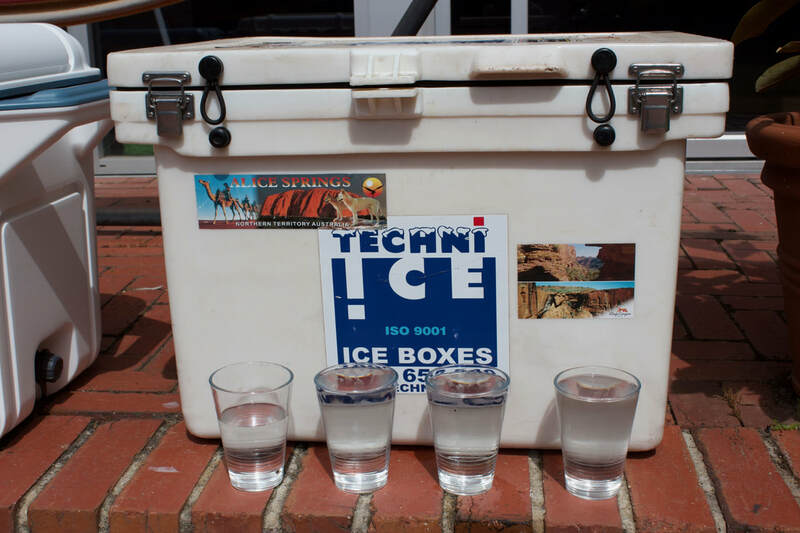 ​We put 5kg of supermarket/party ice (pretty useless for long term camping but handy for this test) in each esky to see how the ice would perform. The battle of the old and new coolers was on. The test was which 5kg bag of ice would last the longest. Mild spring temperatures day and night. All coolers were placed in same area, and exposed to the same amount of full sun and shade. All measurements occurred at the same time each day. The blue esky was a lot smaller internally, so less air moving around the ice which means this little Nylex may have less melting as there was less air circulating. When camping, coolers get opened a lot more frequently than we did. On average we opened our coolers 3 times per day but we opened them all at the same time and for the same duration. Normally, we never take supermarket cubed ice, but take solid bottles of ice, so we knew that cubed ice would melt faster, regardless of the brand. We checked the coolers, and emptied the melted ice into 350ml glasses at 1pm each day. It was our guide to how much ice was melting. After 72 hours, this is how much ice is left. Day 4 - 1575ml emptied, and ice still functional for cooling. Day 5 - Another 1575ml emptied, but now the ice wasn't much good for cooling anything sufficiently. Day 6 - A 7am check saw that there was a few cubes left, but by 1pm, all ice had now melted. To say we were surprised by the OtterBox performance was an understatement. The ice in the OtterBox kept so much longer than we expected, or had experienced with previous coolers. As mentioned earlier, we don't take cubed ice (or use it only as a top-up) but we have had to use top ups more frequently than we have liked when camping in the past. With the OtterBox, I can see this being a lot less likely occurrence. OtterBox state that ice can keep for up to 10 days (room temperature), and whilst we didn't put that claim to the test with our methods, I could imagine that to be true with solid blocks of ice, as opposed to the party ice we used. This durability and insulation comes with a price tag that could make some campers reach for a cold drink when they see it. 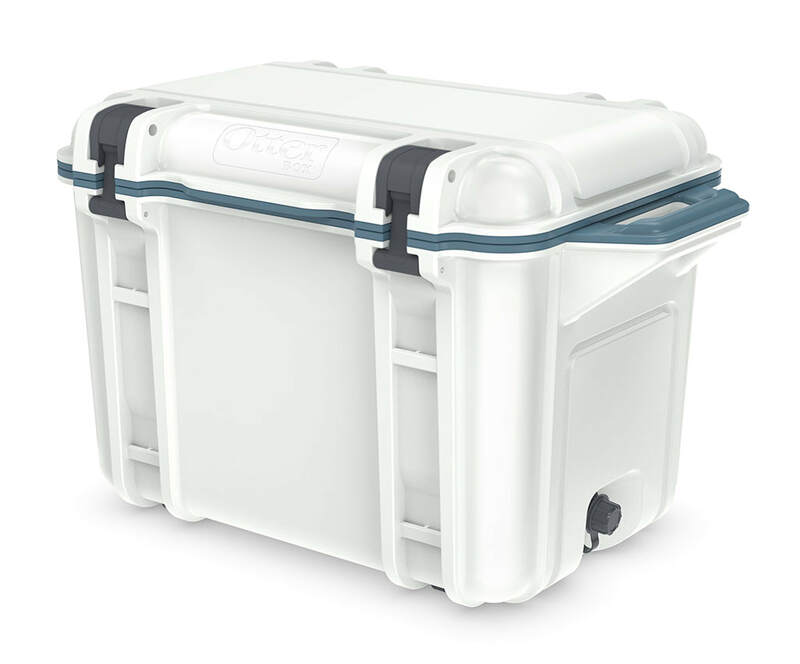 With the price of $500 for this particular cooler, it's not a cheap option to keeping your food cold. But it might be the only cooler you will ever need to buy. Maybe the adage "buy good gear, only cry once" holds very true with the OtterBox? If you don't have a vehicle with all the electrical components in the back to keep a fridge running, then this could be your next best option in terms of cooling your food and drinks. But if your 4WD is set up to with an auxiliary deep cycle battery to run a 12v fridge, then you would probably go the fridge option as the fridge will be a similar price. We hope in the future to update this review as we put the OtterBox to more rigorous ice testing, so check back later. Until then, when we go camping, we know the OtterBox Venture 45 is the esky we will be taking from now on. To find out more about the OtterBox Outdoor Range and for current pricing and how you can get one, see Otterbox Australia. This product was gifted to us for the purpose of this review, but all opinions are our own. To find out about reviews, please read our Disclosure Policy.